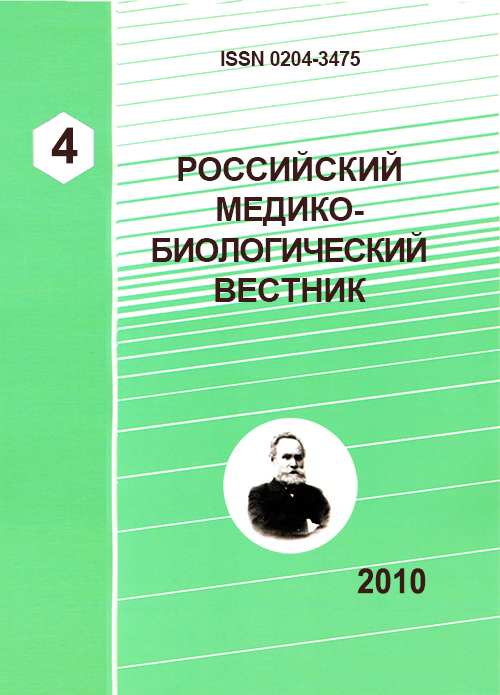 Authors: Popova N.M., Yakusheva E.N., Shchul'kin A.V., Chumachenko P.A., Popova N.M., Yakusheva E.N., Shulkin A.V., Chumachenko P.A. In article data of the research devoted to studying of action of simvastatin on morphofunctional status of thyroid gland at experimental hypothyreosis are resulted. It is shown that experimental hypothyreosis is accompanied by lowering of level Т4, rise of level ТТH and kompensatorno-adaptive changes in morphological structure of a thyroid gland. Simvastatin at experimental hypothyreosis at first reduces, and then increases functional activity of thyroid gland that leads to an expedition of restoring of function of organ. thyroid, hypothyroidism, simvastatin, an experimental study. Аронов Д.М. Лечение и профилактика атеросклероза / Д.М. Аронов.- М: "Триада-Х", 2000. - 411 с.
Аронов Д.М. Плеотропные эффекты статинов / Д.М. Аронов // Рус. мед. журн. - 2001. - №13-14. - С. 578-582. Будневский А.В. Гипотиреоз и сердечно-сосудистая патология / А.В. Будневский, В.Т. Бурлачук, Т.И. Грекова // Медицинский научный и учебно - методический журнал. - 2007. - №38.- С. 80-85. Васюк Ю.А. Плейотропные эффекты статинов - данные фундаментальных исследований / Ю.А. Васюк, Е.С. Атрощенко, Е.Н. Ющук // Сердце. - 2006. - №5. - С. 228-237. Пат. 2165648 РФ, МПК7 G 09 B 23/28, А 61 К 31/4164. Способ моделирования гипотиреоза / Л.Г. Чугунова, А.Н. Рябков, К.В. Савилов; Рязанский государственный медицинский университет им. акад. И.П. Павлова. - 97120428/14; заявл. 26.11.1997; опубл. 20.04.2001, Бюл. 11. Петунина Н.А. Субклинический гипотиреоз: подходы к диагностике и лечению / Н.А. Петунина // Трудный пациент. - 2006. - №2. - С. 1-7. Association between thyroid dysfunction and total cholesterol level in an older biracial population: the health, aging and body composition study / A.M. Kanaya [et al.] // Arch Intern Med. - 2002. - Vol. 162. - P. 773 - 779. Decreased activity of lecithin: acyltransferase and hepatic lipase in chronic hypothyroid rats: implications for reverse cholesterol transport / M. Franco [et al.] // Mol Cell Biochem. - 2003. - Vol. 246. - P. 51-56. Duntas L.H. Thyroid disease and lipids / L.H. Duntas // Thyroid. - 2002. - Vol. 12. - P. 287-293. Nikolaeva A.V. Lipid metabolism and functional status of the kidney in hypothyroid patients depending on the phase of disease / A.V. Nikolaeva, L.T. Pimenov // Ter Arkh. - 2002. - Vol. 74. - P. 20 - 23. Tan K.C. Plasma cholesteryl ester transfer protein activity in hyper- and hypothyroidism / K.C. Tan, S.W. Shiu, A.W. Kung // J Clin Endocrinol Metab. - 1998. - Vol. 83. - P. 140 - 143. The prevalence of subclinical hypothyroidism at different total plasma cholesterol levels in middle aged men and women: a need for case finding / A.J. Bindels [et al.] // Clin Endocrinol. - 1999. - Vol. 50. - P. 217-220. The significance of alterations in serum lipids in thyroid dysfunction. II. Alterations of the metabolism and turnover of 131I-low-density lipoproteins in hypothyroidism and thyrotoxicosis / K.W. Walton [et al.]. // Clin Sci. - 1965. - Vol. 29. - P. 217 - 224. Copyright (c) 2010 Popova N.M., Yakusheva E.N., Shchul'kin A.V., Chumachenko P.A., Popova N.M., Yakusheva E.N., Shulkin A.V., Chumachenko P.A.